A new one for me! NDB2 coming in nicely on 13554 at 1545 UTC 10 Nov 2018. NDB2 heard again at 1844z 13 Nov 2018, with a somewhat chirpy signal. 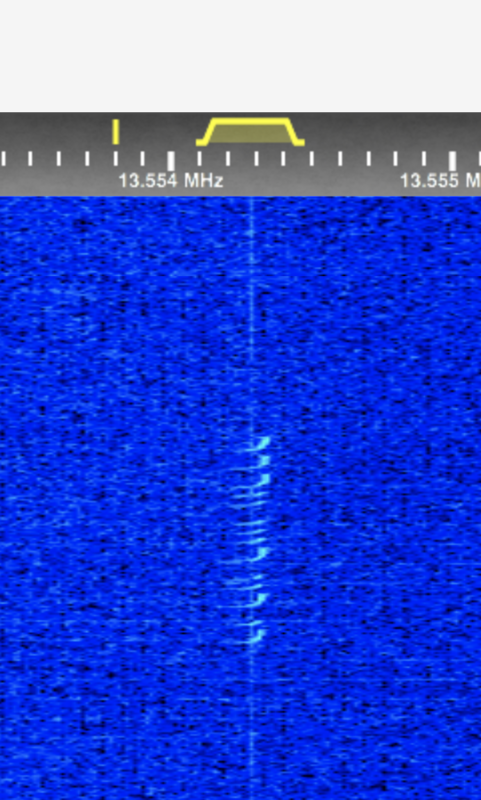 Seems closer to 13554.3 kHz. Copied on my KiwiSDR and 670 ft sky loop antenna. Your kiwi SDR provides an excellent screen shot, Chris. NDB2 on 13554.2 at 1651z 15 Nov 2018. "Your kiwi SDR provides an excellent screen shot, Chris." Indeed it does. From what I've heard of the KPH Kiwi online, these units also appear to have very good sound quality. I'm an analog guy by nature, but this seems like a pretty good tool to have available also. NDB2 coming in at 1756 on 2 Dec 2018. NDB2 heard at 1635 UTC 16 Jan 2019 with a weak signal. Heard, weak and fading in and out, on 13554.01 MHz, 1845Z 24JAN2019. No chirp. Rx: KiwiSDR on OCF dipole, in Midland, VA.
NDB2 heard here 1847 UTC 1 Feb 2019. Again heard 1729 UTC 2 Feb 2019. 13554.2 this morning, 1514 UTC 4 Feb 2019. NDB2 popped up out of the noise briefly at 1528 UTC 22 Feb 2019 for one really strong ID, then back down again. Back again, with a weak signal around 1535 UTC. NDB2 weak but quite readable on the Airspy HF+ and 24 ft. vertical here at 21:50 UTC 03FEB2019. A fair amount of fading, out for a few seconds then back for a few seconds.